Starting with Dr. Bhimrao Ambedkar’s 125th Birth Anniversary on 14th April 2016 and culminating in Panchayati Raj Day on 24th April 2016, in the period between 14th April to 24th April 2016, the Central Government, in collaboration with States and Panchayats, will organize a ‘Gram Uday Se Bharat Uday Abhiyan’ (Village Self Governance Campaign). The campaign aims to generate nation-wide efforts to increase social harmony across villages, strengthen Panchayati Raj, promote rural development, and foster farmers’ progress. 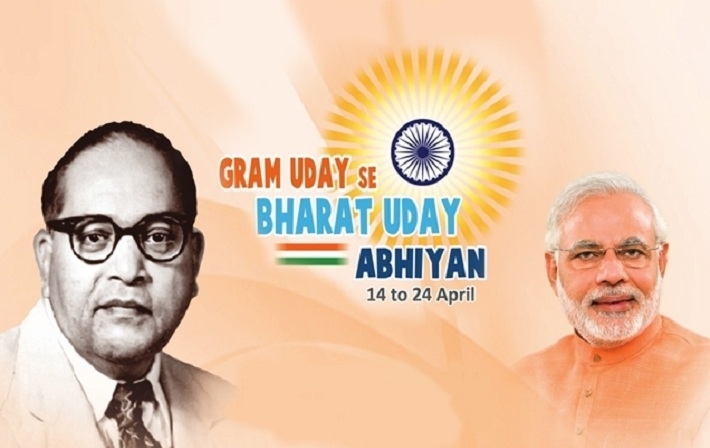 Hon’ble Prime Minister will inaugurate the Gram Uday se Bharat Uday Campaign of 14th April 2016 at MHOW in Madhya Pradesh. On 24th April 2016 i.e. National Panchayati Raj Day, Hon’ble Prime Minister will address all the Gram Sabhas of the country from Jamshedpur, which will be beamed to all the villages in the country, where villagers will gather together to listen to the Prime Minister’s address. In the preceding days, between 14th April to 16th April, 2016 a ‘Social Harmony Programme’ will be conducted in all Gram Panchayats, supported collaboratively by the Ministry of Panchayati Raj and the Ministry of Social Justice and Empowerment. In this programme, villagers will honour Dr. Ambedkar, and resolve to strengthen social harmony. Information regarding the various schemes of the government to foster social justice will be provided. Subsequently, between 17th April to 20th April, 2016 ‘Village Farmer Assemblies’ will be organized in Gram Panchayats. The aim of this programme is to promote agriculture. In these assemblies, information regarding schemes regarding agriculture such as the Fasal Bima Yojna, Social Health Card etc. will be provided to farmers and their suggestions for bringing about improvements in agriculture will be solicited. Preceding the main event of Gram Sabha meetings for Panchayati Raj Day, a National meeting of tribal women Gram Panchayat Presidents from Fifth Schedule Areas of 10 States will be held at Vijaywada on 19th April 2016 focusing on Panchayat and tribal development. • Role of women in village and rural development. • Social inclusion including welfare of Scheduled Castes, Scheduled Tribes, person with Disabilities and other marginalized groups.